Greater Kailash (GK) is popular for being a shopper’s paradise. When you get bored with the repetitiveness of Sarojini Nagar and Lajpat Nagar, GK is the way to level up. And let’s admit, after all that wandering and searching for the perfect objects of desire, shopping makes us all hungry. Saffron is highly valued for its exquisite flavor. Zaffran, Urdu for saffron tries to do the same by giving their customers a pleasant dining experience. While the GK 1, N block market houses many cafes and multi cuisine restaurants, Zaffran specializes in Mughlai and North Indian cuisine. Zaffran has been running the show since the last 14 years and has a loyal clientele. With a calm and serene ambience it works perfectly as a date spot as well as for official meetings. The music does not go beyond a certain level and leaves room for jovial conversations. This branch has been the oldest while the one in CP is a recent addition. Brown seems to be the dominant hue of the interiors with wooden floors and cane upholstery. The décor is very aesthetic and elegant. An eclectic menu printed on a bulky wooden board brings to you the best of Mughlai and North Indian dishes. Bhatti Ka Paneer was a platter of char grilled cottage cheese cubes and had a distinct smoky flavor. The Paneer was soft and well marinated. Paneer Malai Seekh; the name intrigued me and I decided to give it a try. 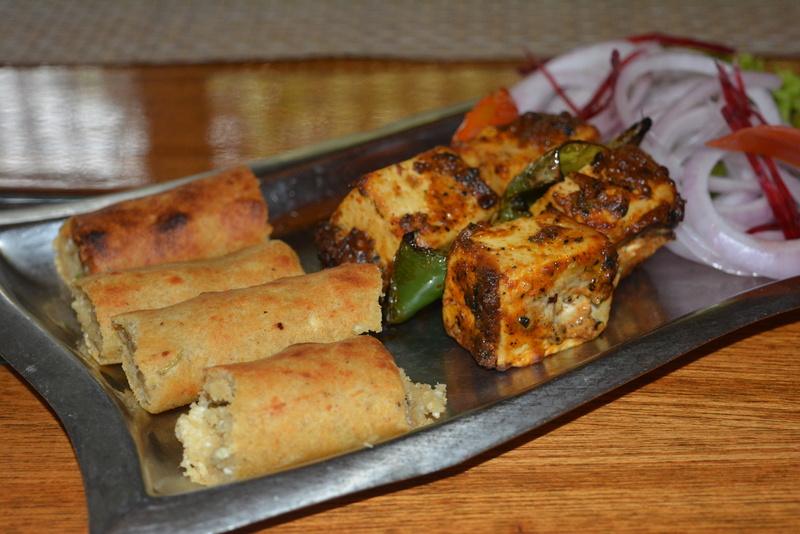 Mashed Paneer was shaped like a Seekh Kebab with bread crumbs acting as the binding element. These were very dry and even the chutney could not save it. The lineup of Non Vegetarian starters was quite impressive too. Raunak e Seekh Kebab was basically a fancy name for Dohra Kebab. Mutton Kebabs were wrapped in a blanket of minced chicken. I wouldn’t say they were the best Kebabs I’ve had, but certainly much better than other restaurants. Besides the colourful symmetry created by two kinds of meat made the platter click-worthy. Murgh Chili Mili was essentially Chicken Tikka. Extremely succulent and slightly charred on the surface, it was one of my favourites here. Kashmiri Chicken Tikka was a big disappointment. Not marinated well, it was dry from inside and therefore became the only dish to require a knife along with the fork. There was nothing ‘Kashmiri’ about it. 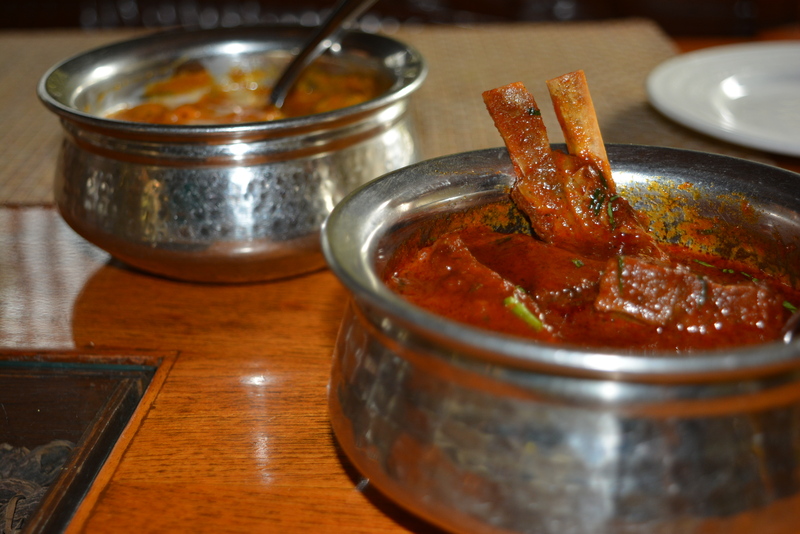 The main course was simple with Mutton Roganjosh, Makki Kumbh Masala and Garlic Naan. The Roganjosh did not stand true to its cultural roots. The mutton is not supposed to be very soft, which was the case here. The meat disintegrated very easily and the texture did not correspond to that of an authentic Kashmiri Roganjosh, Makki Kumbh Masala was a simple yet delectable dish of corn and mushrooms cooked in an orange gravy, akin to Shahi Paneer. Slightly sweet and tangy, it was rich in flavor. The Garlic Naan acted as the perfect accompaniment to both the dishes. We ended the meal on a sweet note with an earthen bowl of Phirni which looked beautiful and had a smooth and velvety texture. 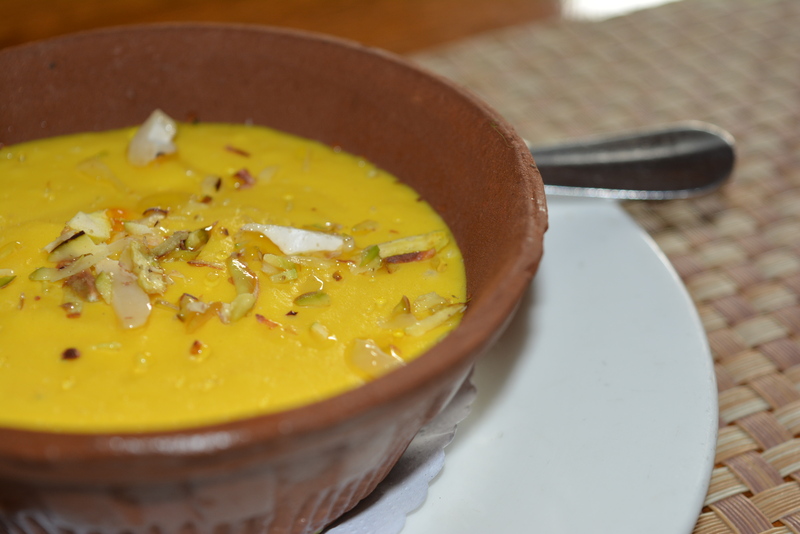 While Phirni is usually white in colour, Zaffran adds a twist to this classic Indian pudding by using Saffron which gives it a tinge of yellow. Each bowl is topped with chopped nuts. You can also pick up a drink from their sundry bar menu. An LIIT or Cosmopolitan is sure to lift up your ‘spirits’. Quite literally! For a classy meal after that rigorous shopping session, trust Zaffran to satiate your hunger and taste buds.